These Carmel pictures take you on a photo tour of Carmel, California. If you click through all of the Carmel pictures, you'll see what Carmel-by-theSea looks like, but there's more here than just pretty pictures. You can also read about each place, learn about the spots where the photos were taken and decide if you want to visit. 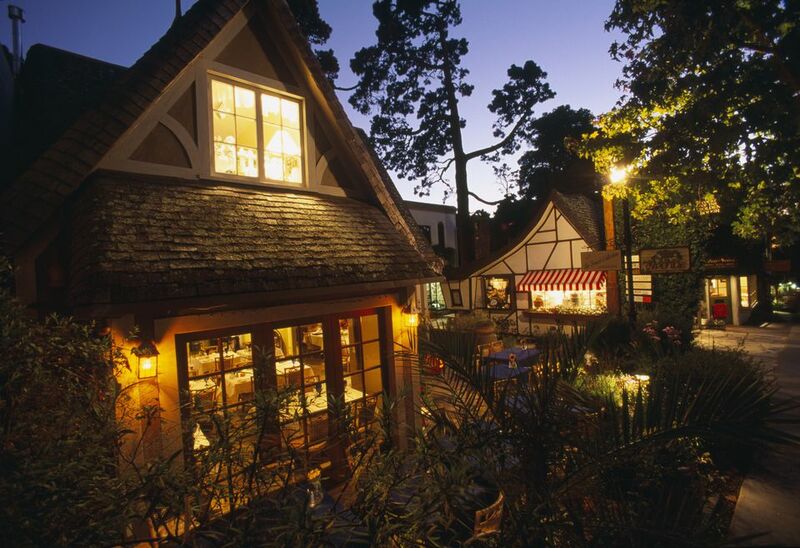 Carmel's signature architecture makes it look enough like a fairytale village during the day, but once night settles in, it can become almost magical. The fairy-tale-inspired architecture of Carmel features roofs that wrap around like this one, redwood shake shingles sheared into interesting patterns and lots of golden-colored chalk rock from nearby Carmel Valley. Local builder Hugh Comstock designed most of them in the 1920s. Carmel is one of the most dog-friendly vacation destinations in California and the Cypress Inn (where these dogs are walking) was one of the first in town to welcome visitors and their furry friends. These days, they're far from the only pet-friendly establishment in town and you'll find both lodging and dining places where your well-behaved pups are welcome. One of Carmel's most charming features are its hidden courtyards. This one is called the Court of the Fountains. Carmel Beach is owned and maintained by the city of Carmel. It's located at the end of Ocean Avenue just a few blocks from downtown. It's a pretty beach with white sand - and very popular with locals and visitors alike. Ocean Avenue is lined with shops of all kinds. These are just a few. This picture was taken from just above Carmel Beach. The whitish-colored splotches you seen in the green across the water is the Pebble Beach Golf Course. To reach the spot where we found this view, follow Scenic Rd. south from downtown Carmel. From its earliest days, Carmel was an artist's colony and while it may have grown a little expensive for the typical struggling artist, it's still filled with art galleries offering a wide variety of artistic styles. Clint Eastwood owned this place many years ago, and its outdoor patio, backed by a scenic mural and warmed by outdoor fireplaces is just as charming as ever. It's on San Carlos between 5th and 6th. While Eastwood no longer owns the Hog's Breath, he does still have a restaurant in Carmel. Find out all about it here. This little piece of culinary artwork is Alaskan black cod fish with cauliflower, sweet Maine shrimp, and Noilly Prat sauce, from Aubergine Restaurant. The little eating and drink spot called Forge in the Forest feels essentially California, with its outdoor courtyard, fireplaces, rustic tables, and vine-covered walls. Overhead heaters make it possible to dine alfresco in all but the coldest weather. Carmel's first European residents were the Spanish Fathers at Mission San Carlos de Borromeo, the place we call Carmel Mission today. It boasts one of the most romantically beautiful mission churches in all of California, and it's open to the public. Read more about the Carmel Mission.